It’s always a good idea to have a dry run of equipment at home before setting off into the deep woods. We found the tent to be still in fine shape, but discovered a multi-room mouse house in our rickety old camp stove which prompted us to add a stove to the ‘replace’ list. Ugh. Left without a camp stove, I decided to cooked the beef patties for our sliders over an open fire, which added a delicious smoky flavour so desirable in camp food. It’s not difficult to do, just let the wood cook down to coals, place a grate over top of them and cook on that. I always brush a little oil on my burgers to prevent them from sticking, and a long handled spatula is best for flipping. 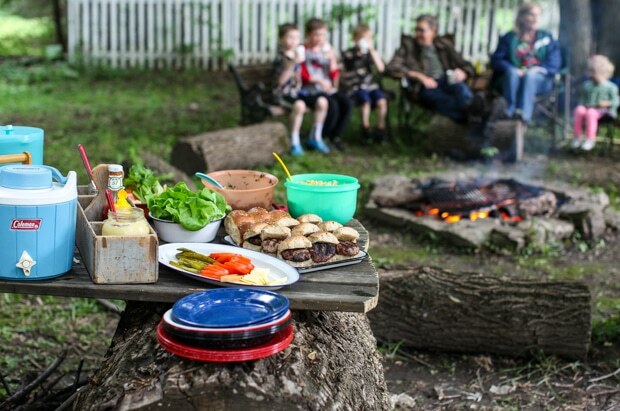 We gathered around the fire and I set up our dinner on the most rustic camp table in the neighbourhood. Remember the great weeping willow that fell last year? We turned the trunk into the base of a table and use our old deck planks for the table top. It’s a bit of an eyesore, but it works and it was free. 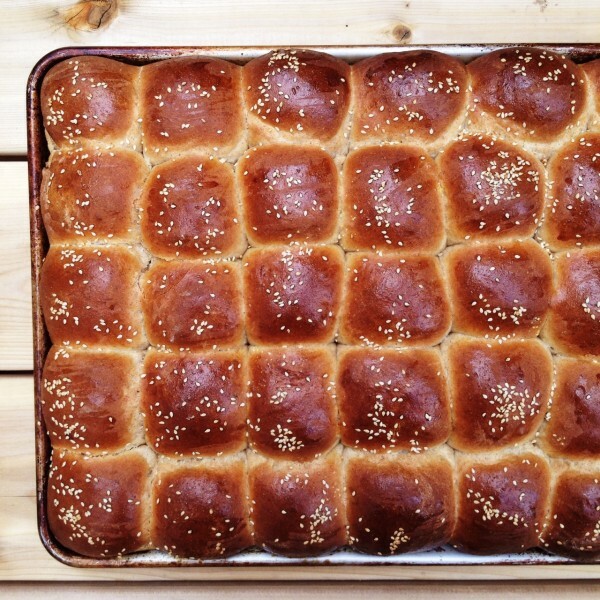 Whole Wheat Buttermilk Buns. This recipe, doubled, and baked side-by-side in a rimmed sheet pan. Beef Sliders. This recipe, minus the blue cheese. Assorted topping and condiments for the sliders. Pasta Salad, my mother-in-laws, which is similar to this one. Crunchy Cucumber & Lentil Salad. A S’mores bar is something we’ll do once over the summer. Camping desserts for us are usually fresh fruit or bananas baked in the coals, but we do splurge on sweets once in a while. I made my Toasted Coconut Marshmallows as well as a pan of plain vanilla and we sandwiched them between gingerbread and graham crackers with slivers of dark chocolate. Morning comes early when you are camping. It’s the birds, singing (or screeching) to high heavens, that rouse even the heaviest sleepers. Our boys tumbled out of the tent around 6:30 inquiring about breakfast, of course, Fortunately I was ready for them. 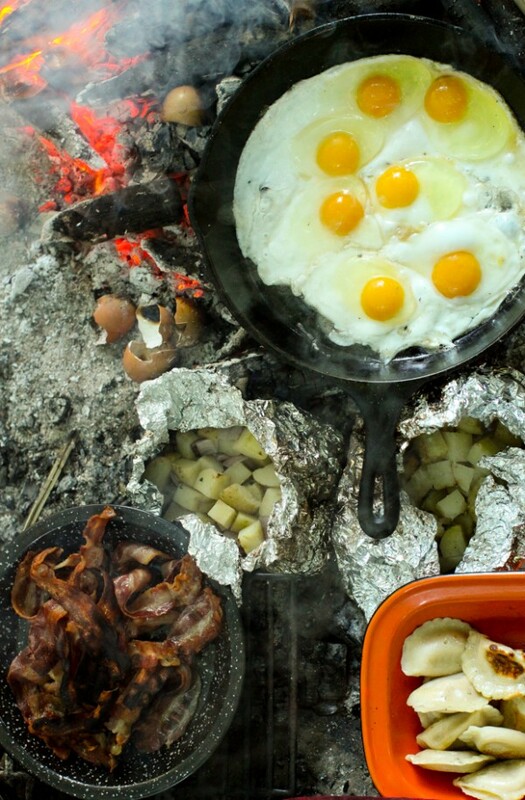 Cooking camp breakfast over an open fire is my strong suite. Equipped with a pair of tongs and a 10-inch cast iron skillet, I turned out bacon and eggs, hash browns and perogies while still in my PJ’s. Coffee and fruit waited on the table and my sister in law, Melanie, contributed her delicious scones with lemon curd. Everything was prepped the day before, which made it easy to cook for the 12 of us. Bacon was baked ahead of time, potatoes and perogies par-boiled, and the fruit platter assembled. We downed two pots of coffee and nearly 2 dozen eggs. The fresh air helps you work up an appetite, that is for sure. I didn’t eat all day after this feast, and our supper was a light green salad picked fresh from the garden. Balance is key, right? 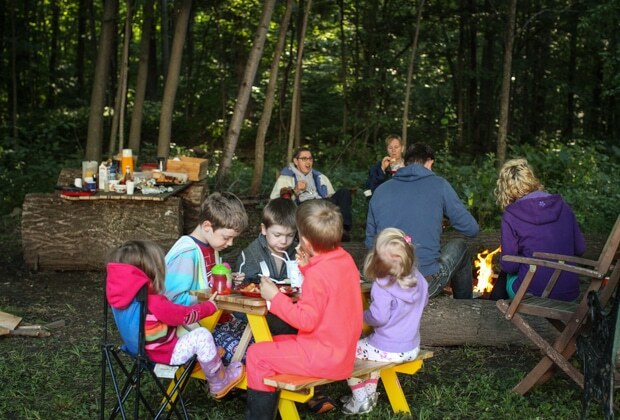 We lingered over breakfast for nearly 2 hours, while the sun rose in the trees behind our campsite and the fire crackled merrily in the centre of our family circle. It was a delightful start to the summer and a good dry run at camping. Next weekend, we’re on our own! We’ve talked before about ideas and equipment for campfire cooking (a must-read) but I wanted to leave you with a recipe for the Smoky Sour Cream and Onion Potato Packets I prepared. 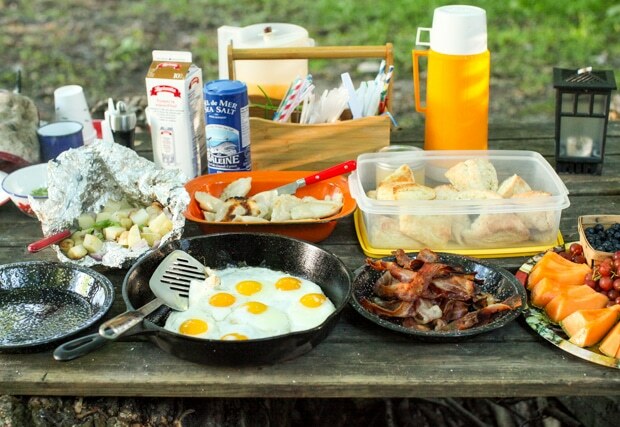 If you are truly camping in the bush, a substantial breakfast is a must to provide energy for the day. I prefer potatoes to bread (they don’t go stale, for one thing), especially when paired with eggs. These potatoes can be prepped the day before and transported to your camp site. They are soft in the centre with crispy edges and delightfully smokey. 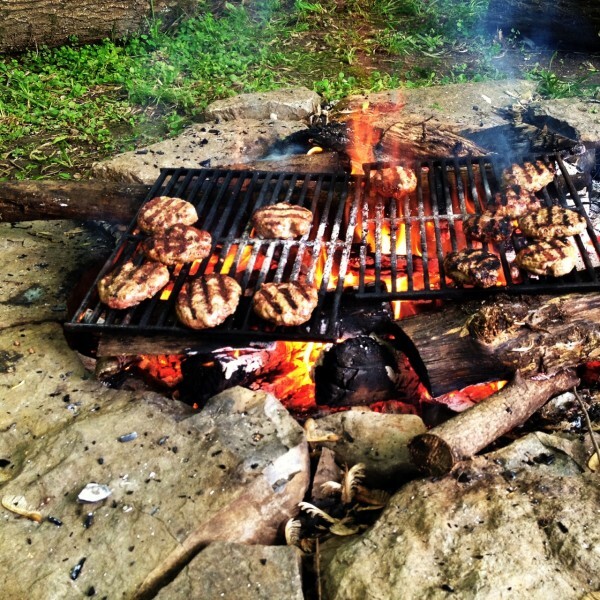 What is a camping meal you enjoy cooking? You and your sister’s camping trip sounds magical- a paddle to a nearby island, sounds so very Swallows and Amazons-ish! 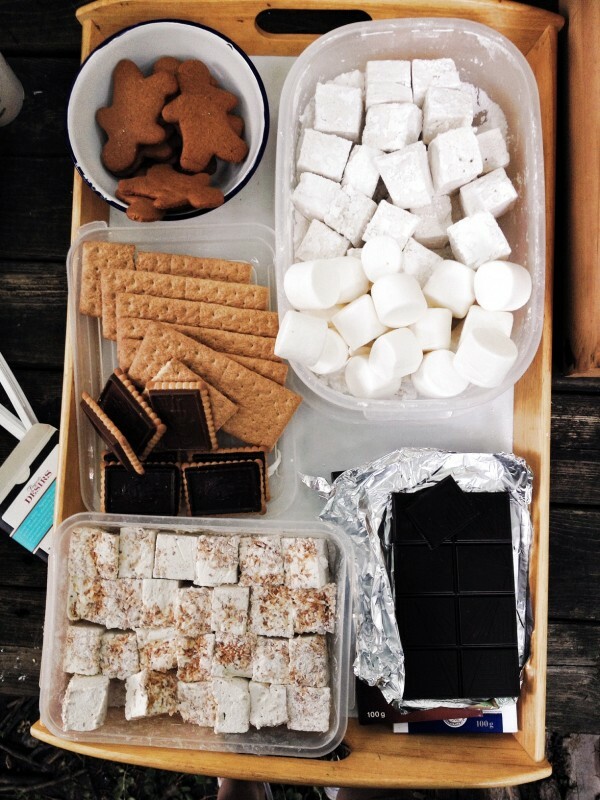 I much prefer fruit or roasted bananas for camping desserts but homemade marshmallows and gingerbread might change my mind on s’mores! Yum. LOVE this idea so much!! 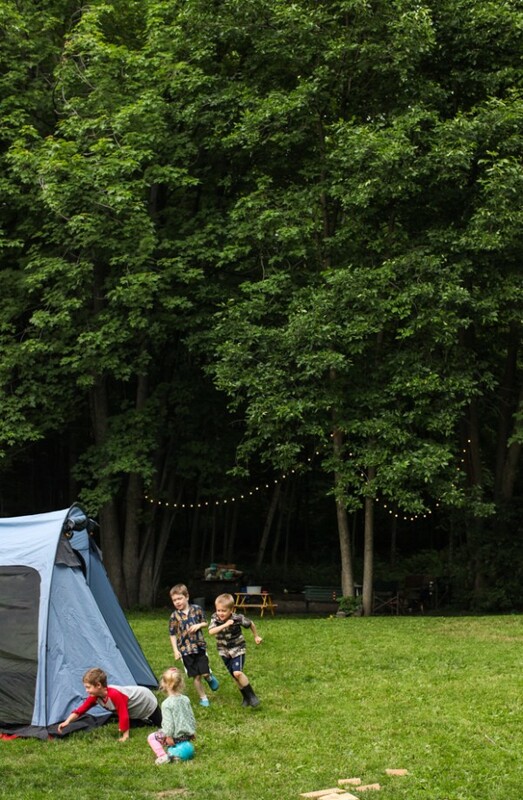 I need a cousins campout asap! You do the funnest things with your kids!! I can’t wait to do this with my future ones 🙂 such a great campout! Oh my goodness, living vicariously! I need a sister or friend like you to invite me to this event 😉 I’ll be the one bringing the scones, haha! Seriously, though, MUST schedule a camping trip. 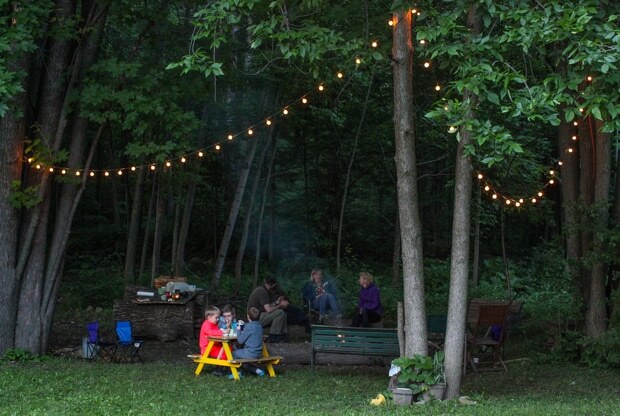 I have not been camping in ages and married to someone who considers the Holiday Inn camping, but I remember my mom making rainbow trout on the campfire and potatoes roasted in the embers. Ahhhh, the good ol’ days. What a fun camp out! I have never had such fancy smores, the look super delicious!